Welcom to visit our Electric Orange Juicer, it has the same outlook as our bestseller 601, the only difference is that the capacity has been expended into 1.2L, which is more suitable for family use. 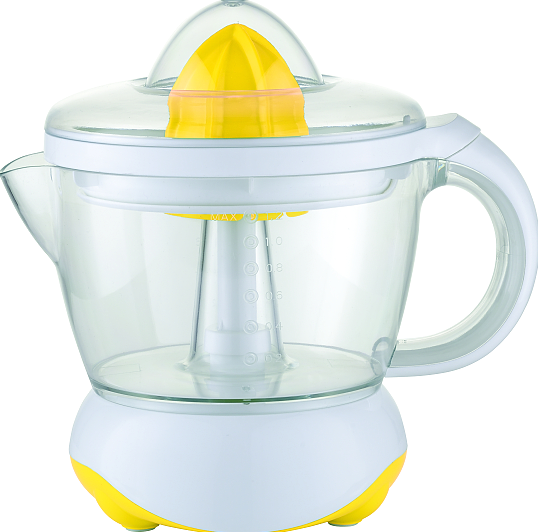 It is an Electric Citrus Juicer with motor inside. All the components are made of safety plastic like PP, AS, ABS, which are totally conforms to the food standard. Fruit Juicer Even though the light weight, the function is pretty good. It has passed many strict tests to get the reliable certificates, such as GS, CE, RoHS, LFGB, CB, ETL, REACH, EMC, etc. and the sampling inspection must be done throughout the whole production process, so the quality can be assured. What's more,As a Orange Juice Makers , we provide 1 year period for the warranty of the products. Looking for ideal Orange Juice Makers Manufacturer & supplier ? We have a wide selection at great prices to help you get creative. All the Best Fruit Juicer are quality guaranteed. We are China Origin Factory of Electric Orange Juicer. If you have any question, please feel free to contact us.